1981 to 2018 - Now publishing our 38th Volume. 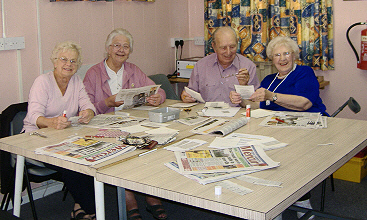 Welcome to the website of Grapevine, The Great Yarmouth Talking Newspaper, a registered charity run entirely by volunteers to provide a free weekly service of local news to the blind and partially sighted people living in the Great Yarmouth district and the surrounding villages, as far north as Stalham. 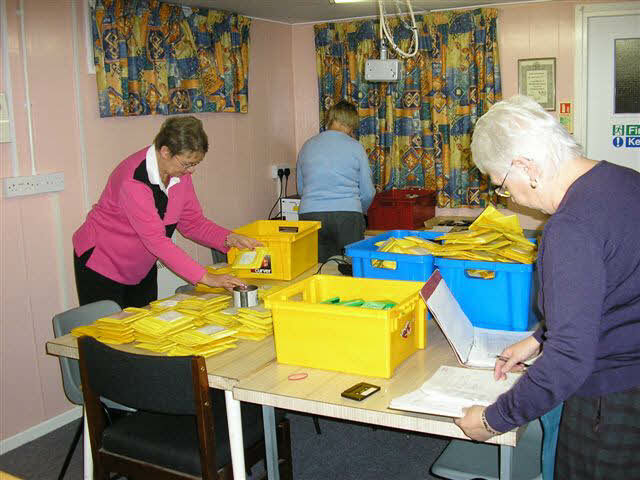 This service was started in 1981, and since then volunteers have been recording news stories taken from the weekly edition of the Great Yarmouth Mercury newspaper, for distribution weekly, originally and until recently on cassettes, and now on usb memory sticks. The number of listeners has grown over the years - we now send out by post about 200 memory sticks to listeners each week. 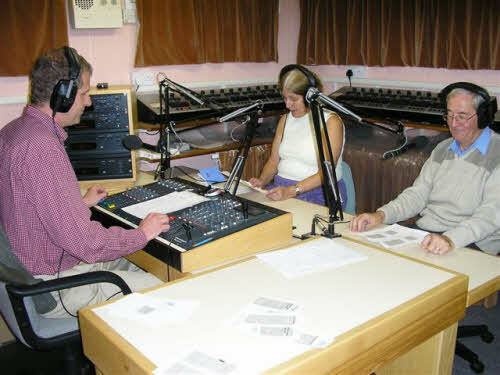 Every Friday afternoon at about 3pm the process of producing the weekly audio news recording begins. The Leader of the week’s Editing Team will have collected four copies of the Mercury newspaper from its office before going to meet at the studio with the other editors who - working on their special topics - read, select, cut-out and paste the selected articles on to paper pages for the readers to read. This is usually completed by 5pm. Photos of two of our editing teams. The sacks of the previous week’s yellow pouches, containing the returned usb memory sticks, are collected at about 4.30pm. from the Royal Mail sorting office in Great Yarmouth and taken to the Grapevine studio. The admin team of four arrives at about this time and opens each returned pouche, removing the usb stick, changing the address label, and recording in the log book the return from that listener. A check is also made to see if a message or letter from the listener has been included. The usb memory sticks are checked and sorted, and prepared for the engineers to use again. There are usually four readers, and they arrive at about 5.40pm together with the Presenter who is leading for that week. The readings are allocated and checked. The engineers will also have arrived and have set up the computer to make the digital recording which is used for the new usb memory sticks and also for the web site and the podcast. They also check the microphones and the recording sound levels. The one hour session starts at six o'clock. It is recorded "live", with a short break at the half-way point. Re-starts are only made if a major engineering fault occurs; the session is not edited after recording. It is in essence a "live" broadcast. Below the picture shows the Presenter's position in our new studio as seen from the engineer's desk The readers sit facing the Presenter. The engineers and the presenter are in eye contact" !! The photo below shows the readers' desk in front of the Presenter. The above photo shows the Engineers' area seen by the Presenter. And below is as shot of the Engineers' desk. Making the 'tracks' and posting. One of our new copiers, each producing 11 usb sticks at a time. The Saphire box at the side is used for quality checking. When the recording is completed the engineers begin converting the four tracks to mp3 format for use on the usb sticks - they also make a combined 'full edition' track for the web and the podcast. The recordings are transferred to the usb sticks using two digital copiers which make high speed copies of the recording from a master stick. 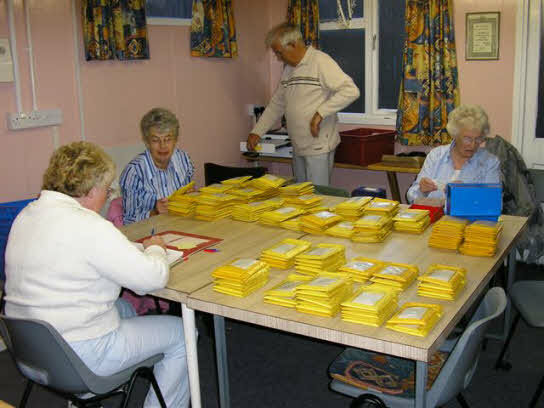 These sticks are checked and then put into the yellow pouches which are taken on Friday evening to the Royal Mail for delivery to our listeners on Saturday morning. The four mp3 tracks and the 'full edition' are then uploaded to our web site from where they can be listened to on-line, or downloaded, or received as a podcast. The on-line edition is usually available by 9pm. To summarize: at 3 o’clock in the afternoon nothing is ready, but by 8.30 the new recording is on its way to the listeners. Why not access the weekly Grapevine edition on the web? Consider the advantages: Access to the week’s recording at any time from 9pm on Friday evening, through to midnight on the following Thursday. And even then, you can still go to our on-line archive and listen on-line, or download, a recording for five weeks. Yes, for five weeks the recordings are kept in our on-line archive with immediate access. Using an easy player which operates by your keyboard – this was especially designed to be easy to use; it was designed by Shaun who is blind and understands what is helpful for blind listeners. Or you can download to your computer the part or parts of the recording which you particularly want, so as to listen to them without spending time on line. There is a page with “buttons” to click if you are partially sighted and prefer that method of control. And if you are into podcasting, then we have it set up for you! And on top of all that, there are four news pages, unfortunately in text only, three of them with up-to-date news from the Yarmouth Mercury and the Eastern Daily Press, also a Sports summary page, and a "What's On" page with the latest activities dates from the Yarmouth Mercury. We hope that you find the facilities on our web editions helpful. Go direct to Grapevine's Easy Player for the week's recording. 2010 was our first "Year of Change"
At the end of 2009, after much discussion, we decided to plan for a change from cassettes to usb memory sticks, and aiming to complete the change by the end of 2010 - maybe even earlier! These usb memory sticks would be sent out in the same manner as cassettes. The usb sticks would require a "player", and after obtaining generous sponsorship, we found that we would be able to give a "player" to each member of Grapevine. To get everything moving we visited listeners to deliver the players, to explain how they work, and to answer questions. We are very pleased to report that listeners have been pleased with the change, and that they are impressed with the great improvement in the sound quality. We are even more pleased to tell you that the change has been carried out well ahead of time - we have ceased to use tape cassettes! A really big "Thank you" to those who have sponsored us with that important encouragement - cash! And a big "thank you" to the Grapevine volunteers who have given a lot of time, in so many different ways, to enable us to make this major change. That was : October, 2010. February 24th. 2012. Another big change for us. Note the date ...... on that evening we made the last recording in the Studio which we had used for 25 years. You ask: "Why?" Well ..... We had notice from our landlord that the area was to be re-developed. Panic !! Where could we go? Fortunately, our landlord offered us alternative accommodation, so although we are safe for two years, we must now start looking for a permanent home. To use the modern phrase: we have had to 'downsize'. Whereas we had three rooms - a recording studio, an engineers recording room and a large room for handling the packets and for all other admin purposes, we now have only two rooms. The engineers are now in the recording studio and the Admin folk have their own area, although a little smaller. So, many thanks to all the volunteers who, by their hard work, made the change happen. We did not miss one week's issue! - Business as usual - And that is really something! We need to find a new location that can accommodate a new portacabin (or find other rooms) from which Grapevine can operate. Then, purchase a new portacabin and fit it out with our existing recording and broadcasting equipment, install a telephone and an alarm system. On top of all those arrangements there will be the cost for the required legal work to be done relating to the new premises. Grapevine has found a new "permanent" location from which to operate. Tonight, we made our first recording session in our new studio. A great deal of volunteer work has been required to create this studio, and the admin section, in what was a very large and bare room. A sound-proof partition had to be constructed, and both rooms decorated and fitted out. And then, of course, the studio equipment had to be set up and the admin filing cabinets etc all moved during Easter week. A major operation and we did not miss an issue. Congratulations to all those who gave their time and energy on an excellent result ...... and MANY THANKS! Important update : 11th. October, 2013 - and our "Thank You"
BUT, (there is usually a "but") there will be a cost to be covered for rental, lighting and heating, and we shall need financial support to meet those costs. Those of you who read these pages occasionally will know that this "plea" for donations started a while back, and you have not let us down. So we want to record our thanks to all who during the past months have made donations - both small and large in pound numbers, but all large in generosity - Thank you, Thank you very much! Even so, we do really need your generous support to continue, or, if you have only just found us ... Please start! Thank you. Almost 200 listeners receive the recording each week. This enables them to keep abreast of local news and information relevant to them so that their sight problems do not isolate them from the community. The broadcasts are well received by the listeners and we often receive praise from them and their relatives for the service which we enjoy providing. Our listeners really appreciate the news, events and articles which aim to help them, and also to expand their interests. Please make a donation via Norfolk's secure ; "Localgiving.com"
AND .... have you got two or three hours spare once a month ? 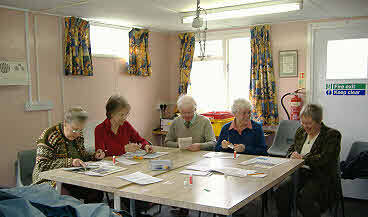 Volunteers are always welcome. Grapevine particularly needs helpers in the following three areas: Editorial staff - able to gather relevant articles from the local press and organise them into a script for broadcasting. Readers - able to read pre-prepared material on air in a lively, interesting manner. Recording engineers - who make the recordings and copy to the usb sticks. Aerial view of wind turbines on Scroby Sands. Caister water tower in the background. Rough seas off Yarmouth harbour south pier. 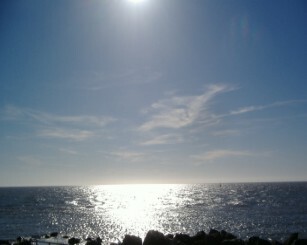 Gorleston cliffs from Gorleston pier. Contact Us at Grapevine with your comments, news and great ideas. One hour's weekly news edited and distributed by The Great Yarmouth Talking Newspaper Association.